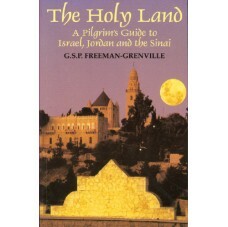 By definition, a guide book must be easy to carry around, and this beautifully illustrated little guide for pilgrims to the Holy Land is just that. It is principally concerned with the Gospels and the places where the events of the Redemption took place. It includes an excursion to Jordan, where the ancient Israelites wandered, and one to Sinai, to the mountain where the Ten Commandments were revealed. This is the order observed since the fourth century by pilgrims. After general notes and a historical introduction, the itineraries start from Jerusalem, and proceed to cover all the places associated with the life of Jesus Christ, and the final drama of the Passion, Resurrection and Ascension. Nearly Everything You Wanted to Know about "The Holy Land: A Pilgrim's Guide to Israel, Jordan and the Sinai" you can find here! Where is the Chapel of the Burning Bush? Where are the Tombs of the Kings? Where are the "Desert Castles"? Where is the Inn of the Good Samaritan? To make a pilgrimage to all these and many other sites all you need is "The Holy Land: A Pilgrim's Guide to Israel, Jordan and the Sinai"